It is raining in Calif ornia and all of creation is glad. 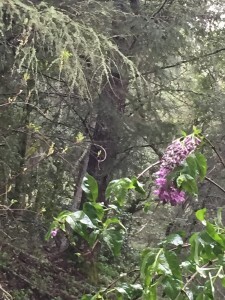 The fir tree out my window has already added an inch of new spring green needles and there is lilac blooming along with the bulbs and every sort of grass that has waited out the drought to come forth again. I have always loved that the labyrinth organization I belong to is called Veriditas, after Hildegaard von Bingen’s concept of Viriditas, the greening power of God. There is something that happens to us all collectively at this moment in the year. Whatever is in us that seeks to emerge and grow is quickened by the sprit that shows so exuberantly in the world around us. I’ve been busy this morning advertising my fall pilgrimages to England, France and Portugal. As I think about each of those places, whatever is seeking to emerge in me sighs in relief. I depend on my journeys to renew and nourish me, to call me out of winter doldrums and political madness and to remind me of ties that bind me to tradition and place, where I remember more easily who I am and how I belong. Over the weekend I visited my cousin who had boxes of photos from our parents and extended family In this cache, was a scrap book my mother made documenting the true love of her life. I always heard about the handsome cowboy who kept her heart long after she married my father, but I felt so ridiculously happy to see him in old photo with her, happy and relaxed leaning up against him. I never knew before that my mother was loved. It is 20 years too late to ask the questions, but I felt something stir in me just seeing that photo and reading his kind notes to her, I will tend this shoot of love, just emerging. This entry was posted in Uncategorized on March 20, 2016 by Judith.